ESA's LISA Pathfinder mission has demonstrated the technology needed to build a space-based gravitational wave observatory. In a paper published today in Physical Review Letters, the LISA Pathfinder team show that the test masses are almost motionless with respect to each other, with a relative acceleration lower than ten millionths of a billionth of Earth's gravity. The demonstration of the mission's key technologies opens the door to the development of a large space observatory capable of detecting gravitational waves emanating from a wide range of exotic objects in the Universe. "LISA Pathfinder's test masses are now still with respect to each other to an astonishing degree," says Alvaro Giménez, ESA's Director of Science. "This is the level of control needed to enable the observation of low-frequency gravitational waves with a future space observatory." "The measurements have exceeded our most optimistic expectations," says Paul McNamara, LISA Pathfinder Project Scientist. "We reached the level of precision originally required for LISA Pathfinder within the first day, and so we spent the following weeks improving the results a factor of five." "Not only do we see the test masses as almost motionless, but we have identified, with unprecedented precision, most of the remaining tiny forces disturbing them," explains Stefano Vitale of University of Trento and INFN, Italy, Principal Investigator of the LISA Technology Package, the mission's core payload. "The performance of the laser instrument has already surpassed the level of precision required by a future gravitational-wave observatory by a factor of more than 100," says Martin Hewitson, LISA Pathfinder Senior Scientist from Max Planck Institute for Gravitational Physics and Leibniz Universität Hannover, Germany. "We have observed the performance steadily improving, day by day, since the start of the mission," says William Weber, LISA Pathfinder Senior Scientist from University of Trento, Italy. At even lower frequencies, below 1 mHz, the scientists measured a small centrifugal force acting on the cubes, from a combination of the shape of LISA Pathfinder's orbit and to the effect of the noise in the signal of the startrackers used to orient it. While this force slightly disturbs the cubes' motion in LISA Pathfinder, it would not be an issue for a future space observatory, in which each test mass would be housed in its own spacecraft, and linked to the others over millions of kilometres via lasers. "At the precision reached by LISA Pathfinder, a full-scale gravitational wave observatory in space would be able to detect fluctuations caused by the mergers of supermassive black holes in galaxies anywhere in the Universe," says Karsten Danzmann, director at the Max Planck Institute for Gravitational Physics, director of the Institute for Gravitational Physics of Leibniz Universität Hannover, Germany, and Co-Principal Investigator of the LISA Technology Package. 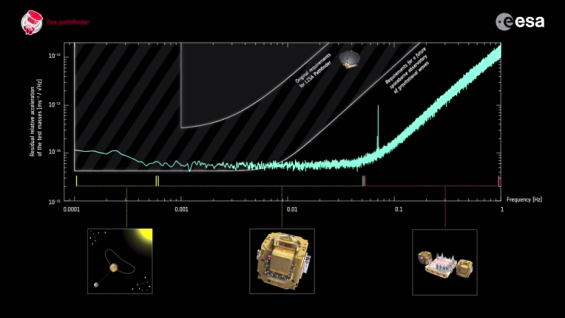 Today's results demonstrate that LISA Pathfinder has proven the key technologies and paved the way for such an observatory, as the third 'Large-class' (L3) mission in ESA's Cosmic Vision programme. "Sub-femto-g free-fall for space-based gravitational wave observatories: LISA Pathfinder results," is published in Physical Review Letters. The results were presented today during a media briefing at ESA's European Space Astronomy Centre in Villanueva de la Cañada, Madrid, Spain. There will be an Ask Me Anything session on Reddit on 7 June at 14:00 CEST (12:00 UTC).